Marco Bordogni (1788-1856), a celebrated tenor of the 19th Century, wrote these vocalizes during his later career as a voice teacher. 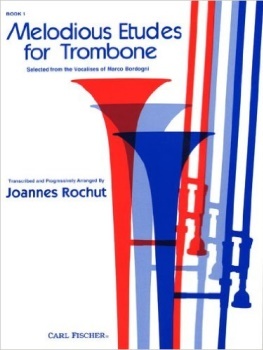 Transcribed and adapted by Joannes Rochut in three books, these became the cornerstone of the trombone repertoire. Book one offers the trombone student the first sixty etudes in the series and promotes musicianship, flexibility and technique. A must for all trombone students!